We are currently processing the second half of the Stephen Solender Subject Files. 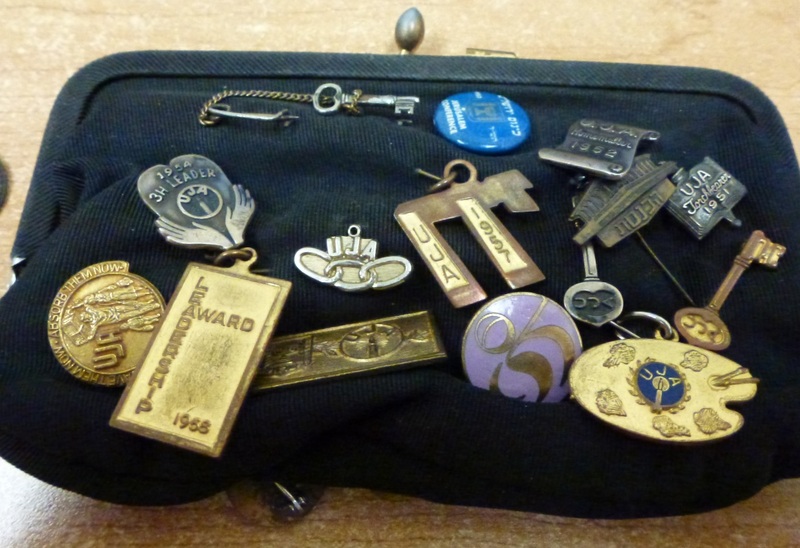 While arranging these files for processing, I discovered a small purse containing UJA pins. 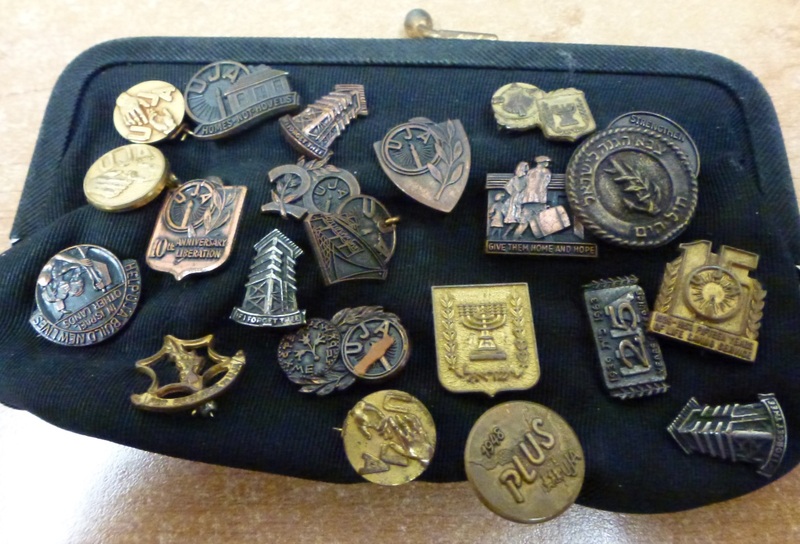 The purse was appropriately housed in a folder entitled “Donated Purse w/ UJA Pins.” We have not encountered that many artifacts in the collection thus far, so a find like this is great! There are 37 pins attached to the purse, covering almost the entire surface area of the purse. The pins contain slogans evocative of the times they were from. Pins containing such slogans include “Save Them Now, Absorb Them Now”, “Strengthen The Settlements,” “Give Them Home and Hope,” “Homes Not Hovels,” “If I Forget Thee,” “$100000000 for Refugees”, “1939-1953 Fifteen Years of Life Saving Service,” “Help UJA Build New Lives – In Israel and Other Lands,” “For Service to UJA”, “UJA Torchbearer 1951”, “U.J.A. Homemaker 1952”, and ﬣﬤנּסּתּ (“The Knesset”). Pictured below are two images containing both sides of the purse, shielded with pins. Click images to enlarge. We will continue to blog as more interesting artifacts are found. Two of the most gratifying moments I’ve had working on the UJA-Federation of New York collection have been finding links to my own family. I knew my dad had been president of Federation in Raleigh, NC for a few years in the 1970s or 1980s, but was surprised in 2012 while working in the Federation of Jewish Philanthropies of New York (FJP) collection to find Dad’s name listed in a memo to Sanford Solender, then EVP of the FJP. A relative of Solender’s was moving to Raleigh and someone in his office had compiled a list of contacts at the synagogues and other Jewish organizations in the Raleigh area, including my dad’s name and phone number. This week, more than a year later, we were finish up the processing of 73 boxes, including 20 boxes of UJA photographs from the 1940s to 1973. Most of the photographs, more than half the boxes, are fundraising events from 1969 to 1973, categorized by community, synagogue name, trade group or women’s division. 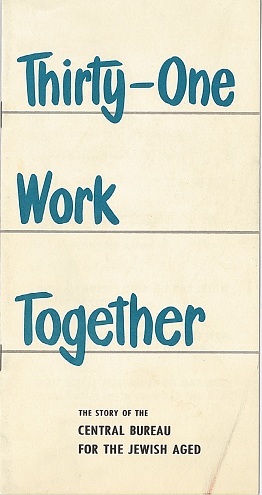 Catching my eye were two folders in “communities”, from Mount Kisco. Before we lived in Raleigh we lived near Mount Kisco where our synagogue, Bet Torah is located. The date range was right, 1969 and 1970, so I pulled the folders and was thrilled to see some photographs in 1970 of my dad with other members of our synagogue at a UJA fundraising event there. 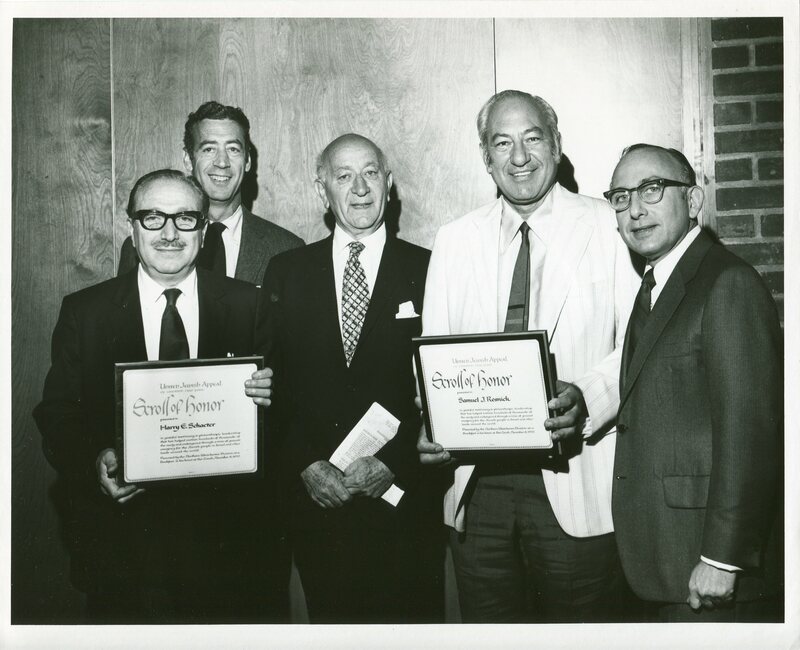 Receiving awards for leadership in the Northern Westchester Division were Harry E. Schacter and Samuel J. Resnick. 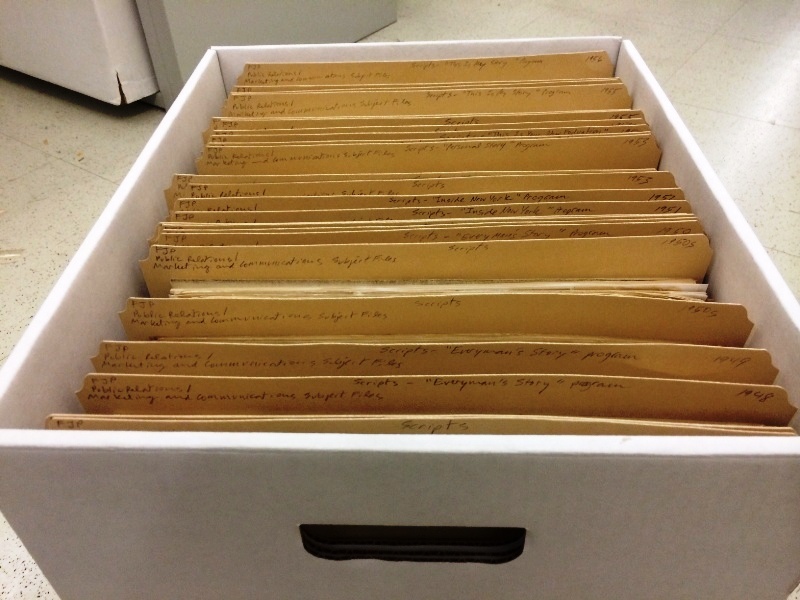 Eleven boxes of archival materials related to the Central Bureau for the Jewish Aged (CBJA) are now open and available to researchers. 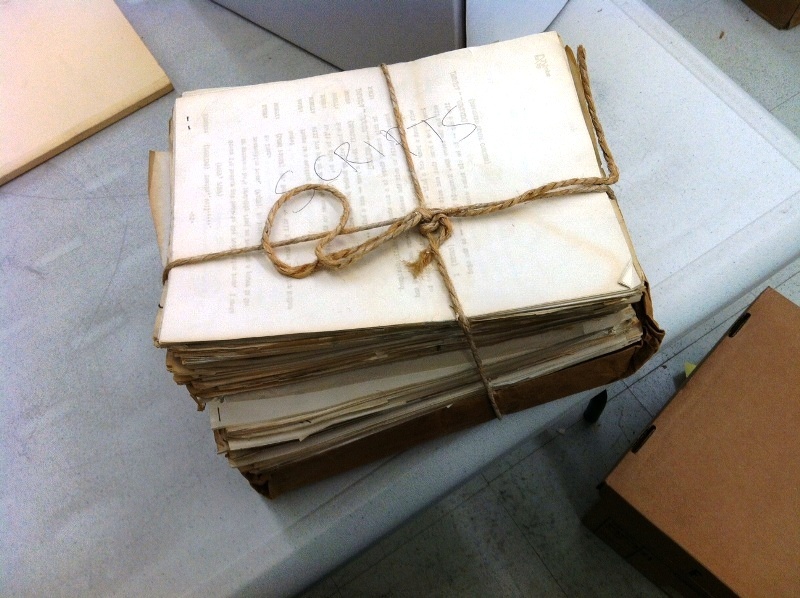 The CBJA files capture the most complete account of the Central Bureau, from the incorporation of the agency to final sets of Executive Committee minutes, with coverage from 1945-1988. 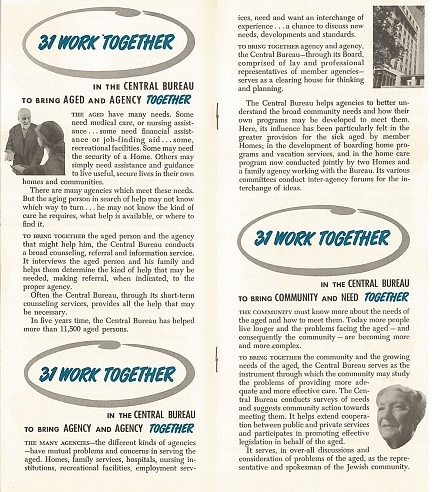 The Central Bureau for the Jewish Aged (CBJA) was founded as an umbrella agency (an agency made of many other agencies) by the Federation of Jewish Philanthropies in 1945 and continued through the merger of the Federation with the United Jewish Appeal of Greater New York until circa 1988. In the minutes of the January 1988 Central Bureau Executive Committee meeting, a member of the committee recounted that the Central Bureau began as an extension or offshoot of Jewish Family Services (JFS) “at a time when work with the elderly was considered unimportant.” Unlike a Federation-affiliated agency that interacted directly with elderly Jewish clients and their respective families, the Central Bureau was established as a way to organize a variety of different agencies that, at least in part, offered direct service and programs to the Jewish aged. Moreover, the umbrella agency was unique in several other respects: it was a Federation subvention agency, rather than an affiliated institution, that planned, coordinated, and facilitated communication between Federation and non-Federation agencies providing care and services to the Jewish aged and, at its height, collaborated with agencies located throughout New York City and in New Jersey. In a collaborative spirit that seems ahead of its time, the by-laws of the Central Bureau committed the agency “[t]o serve as the instrumentality through which the metropolitan Jewish community may study the methods for best providing effective care for the aged…” where the best and most effective care for the Jewish aged in New York or New Jersey might come from a Federation-affiliated or non-affiliated agency. The Central Bureau was supported by member agency dues and, as a subvention agency, an annual grant from the Federation. There were 28 original member agencies that comprised the Central Bureau in 1945, 31 member agencies in 1951, and, by 1966, had doubled its membership with 52 participating agencies. Near the time of the Bureau’s dissolution sometime in 1988, their Executive Committee was especially concerned about the future of the agency, in that, their membership had decreased to 28 agencies. The number of member agencies fluctuated and the roster of agencies changed, but included homes for the aged, hospitals, family agencies, group work agencies, camps, and an employment and guidance service agency. We are greatly enthused that this portion of the UJA-Federation of New collection is now available for research; the CBJA files demonstrate an enviable sense of collaboration and coordination between Federation agencies and other institutions that provided care and services to the Jewish elderly in New York and New Jersey.